Spartacus I opened 15 years ago. It was opened due to the ever increasing demand for Spartacus rolls and sandwiches, which we were selling in the local Spar shops and newsagents. We noticed that the crowds gathering around the fridges containing our sandwiches, just kept getting bigger, and the shops demands was getting harder to keep up with. 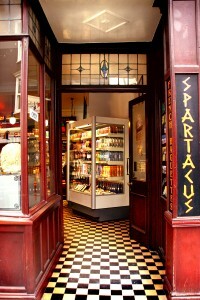 So, Spartacus I opened its doors in March 1992. Although Spartacus I sells directly to he Public over the counter, the majority of what we now do, is to supply other retail units with sandwiches, small filled rolls, large filled rolls, oatmeal filled rolls, filled ciabattas and filled baguettes. Here you will find a very busy sandwich bar that is unlike any other sandwich bar, with hand painted murals of ancient Greek fighting scenes, a mahogany serve over counter that is hand made with Roman Corinthian pillars and staff all wearing overalls claiming I'M SPARTACUS. 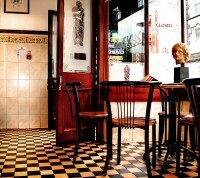 Although the décor and surroundings are unique,its the food that we sell that we feel sets us apart from the ordinary. Our main business has always been our baguettes, which we cook on the premises. These are genuine French baguettes made with real French flour. They are cooked constantly throughout the day, which ensures they are always fresh (usually warm too). Our baguette fillings are all made at the premises, which ensures that they are always fresh and also unique to us, like our very popular Gladiator baguette (chicken and bacon in mayo) or the also popular Cleopatra baguette (lemon and coriander). Many of our baguette or sandwich fillings have been created by us, which we feel sets us apart from the ordinary. Apart from baguettes, Spartacus II has also created an amazing menu for our increasingly popular paninnis. These even have Spartacus written into the bread, which is an amazing effect. As with our baguettes, our paninis are made with our own home made fillings, and with fillings created by us, like goats cheese and caramelized onions, brie pesto and roasted cherry tomatoes or maybe chicken, bacon and mozzarella, its not hard to see why they are becoming more and more of a hit with our customers. Along with our creamy cappuccinos and milky lattes you can also enjoy a very healthy smoothie made with pure fruit and blended with pure orange juice freshly squeezed by us on the premises, and usually right in front of our customers. Spartacus II has some seating inside, so if you choose you can just sit down enjoy reading one of our complimentary news papers and let our well trained staff take care of you. So, whatever your situation, be it relaxed or in a hurry, just call in and savour the difference. Your taste buds will be glad you did.